This sounds nice! 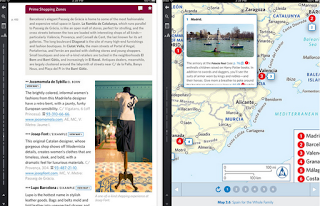 Frommer's have come up with a an interactive travel guide for iPhone and iPad. The content is downloaded, so you don't have to worry about roaming costs. You can browse through data, get local weather updates, read user reviews (from Tripadvisor) and share your own opinion's. You can even highlight interesting part in your guidebook (like you would in a paper version) and this part gets saved, so you can get back to it later with ease. Read more about these new interactive guide books in the article below by Sonia Paul.